Beautiful Princess Monica is a lonely girl indeed. Click here to play! She has everything a woman could want except for two things: a chest of ridiculously sized hand jewels, and a man. Fortunately, Monica is quite a shallow Princess and has stated that any person who can gather for her a horde of precious stones will have not only her hand in marriage, but also the entire Kingdom left to her by her father. Sound intriguing? Play this 5-reel, 9 pay-line slot machine today for your chance to become as rich as a King! 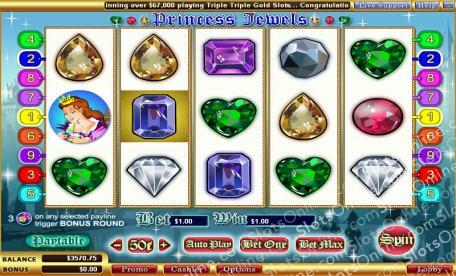 The Princess Monica symbol is not only Wild, but also pays out at 10,000 times your stake when 5 of them appear at once. Keep a keen eye out for the Old Hag symbol as well; landing 3 of them will send you straight to the Bonus Round. You will immediately be faced with the Wheel of Jewels and asked to spin each of the three circles within it. When the circles stops spinning you will have won three precious jewels that will payout into your balance. The Princess Monica is calling your name, knight; bring her an abundance of jewels and you shall be greatly rewarded for your service! The Princess symbol is Wild in Princess Jewels. It also pays out 10,000 times on wagers when 5 appear at once. 3 Old Hag symbols found on any active pay-line will trigger the Bonus Round.